At low speeds, with auto clutch off, the car "accelerates" by its own a little bit when upshifting. Is this supposed to happen? Is it from the original release or a sound pack? I kept all my sounds as as the default on what came with the mod. I may have what is needed. I might be a bad person because of this but for SCE i restored the original Bentley sound(which was louder and better) from the stolen EEC GT3 beta mod as it had the original sounds. Yes that soundpack is in the stolen mod too. @Nelson Lira wrote: At low speeds, with auto clutch off, the car "accelerates" by its own a little bit when upshifting. Is this supposed to happen? I noticed that too. No worry on stalling the car, lol. If it was labeled as "03 EEC GT3 Sounds v1.0.rar", I'm uploading to my mediafire account now. Need to remember that link when back home, thx a lot! @CrivitzChris wrote: If it was labeled as "03 EEC GT3 Sounds v1.0.rar", I'm uploading to my mediafire account now. Most of these sounds are the same as whats in the mod except the aston and maybe the Bentley. A real huge wonderful AMS mod, PATR10T ! Am I the only one to notice this ( as I didn't find any other comment about this problem ).... or do I have a problem somewhere else ? NB: I'll keep an eye on an endurance race here with those cars .... ( choose one out of the pack will be very difficult ) as I'll respect of course your wish not to see another server with those cars in the WE. Meanwhile ... have a nice holiday time, Patr10t. and where is such a request? @Kalinin wrote: Increased physic rate in AMS gives some more feeling about the cars. Not sure if you noticed yet, but the engine.ini's from the beta have new entries added as well, a VTHROTTLEGEAR section, seems to be the same numbers currently for every car. I guess that could be the ECU? 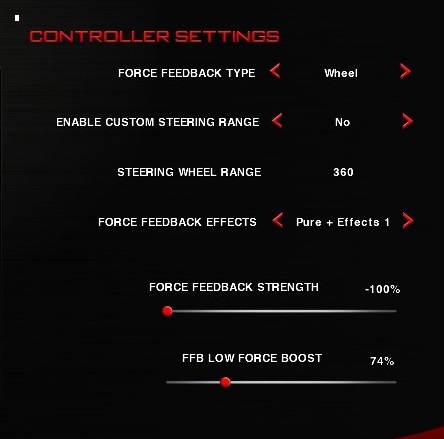 Any advices regarding FFB to drivers using G25? I'm feeling the FFB kind of "flat", comparing to other cars. Anyone using G25? Which are your settings?